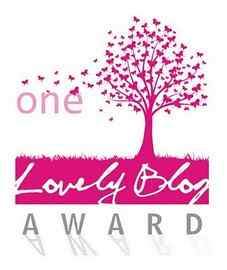 I have recently been doubly honored in receiving my second “One Lovely Blog Award” from danblava at hurdlestohappiness. Thank you so much!! 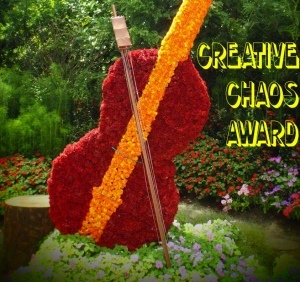 Also from Michelle at michellesomer.wordpress.com – I have been honored with the “Creative Chaos Award” Thank you so much to both of you for keeping me in your thoughts for these awards!! I am so very appreciative! 1) I need to thank the person who nominated me. 2) Share 7 things about myself that you still may not know. 4) Notify the nominees that I have done so. 5) Put a logo of the award on my site. 1) I love to knit – when I have the time…it’s very relaxing…like therapy. 2) I really really love to play video games, with my kids or my friends! 3) I drive an old ’93 Suburban and I love it – Respect on the road! 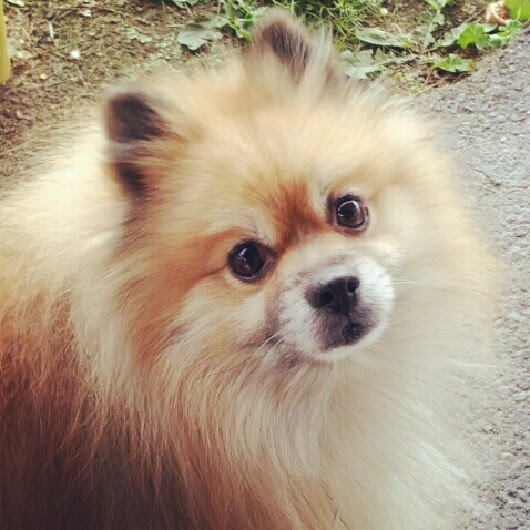 4) I named my dog (Pomeranian) Dante not just for the author but also because I love the movie Dante’s Peak. 5) I love destruction of the earth movies like 2012, The Day After Tomorrow, and more – not sure why…maybe because they are so unrealistic (not the graphics-the storylines) and I’ve had my fair share of ‘reality’. 6) I never want to mow the lawn (it’s big) but always LOVE the feeling of accomplishment when I’m done! 7) Ok, ok, ok….so more information on the video game thing. My best friend and I often play Rock Band 3 (I’m the drummer) – It is a most cherished time to relax, be silly, laugh, and pretend we’re rock stars! 2) I love naming my animals’ weird names – i.e. my orange cat is named Julius, and my oldest female cat is named Sawyer – her brother who is no longer with us was named Thomas. 2) Are you a glass half empty or a glass half full kind of person? Most definitely a glass half full kind of person. I believe that I can find a positive in just about every negative situation. I may rant a bit…but then I just have to find something to laugh or joke about. Sometimes, I wonder where the glass is, as I am convinced someone moved it! 3) You find yourself in a desolate place when your car breaks down. You have no cell phone service, no Wal-Mart, and only a candy bar for food. It is 150 miles to the closest town. What color are your underpants and why? 4) And the last task is to nominate 5 bloggers who have recently started following you. Well done, The photo of Dante (your pet) is adorable! It is quite amazing really that these can mean so much to me…but they do! 😀 Thank you very very much for your sweet praise! Blessings!! Congrats Dear 🙂 you deserve it !!! Click Appearance –then choose Widgets. Once your there you will choose the Image’ widget by clicking ‘add” on the Image widget. It will open a little window and ask you for the URL for your image. That’s where the other window you have open with your One Lovely Blog post showing comes in handy. Go to it and click on the URL (web address of that page) and copy it. Now go back to the other window and paste that address into the Image Widget URL section. Follow the other directions in that Image WIdget and click finish or upload or ….can’t remember what it says. Then go to your One Lovely Blog window and hit refresh…it should be there! If that was super confusing I’ll aplogize now and give you this link to the WordPress site that helped me figure it out. If you copy and paste the below web address it walks you through step by step. I’m so glad it worked!! 🙂 Yay! I’m more than happy that you have more smiles…you deserve them!! I can relate…this wonderful place has brought me the same! Hugs and Blessings to you sweet friend…have a wonderful day! Ha! I love disaster movies… especially the end-of-the-world ones… being 2012 an’ all, I’m on a kinda marathon right now… finished Dr Strangelove the other night… watched the original Day The Earth Stood Still a few weeks back… and then The Day The Earth Caught Fire shortly after… if you don’t know it, look it up.. it’s an old British film from when we still made movies – the 1960’s – the science is silly, of course, but the writing is top-notch and socially realistic… you’ll see what I mean…. You astound me with being a glass half full person. It shows your strength.